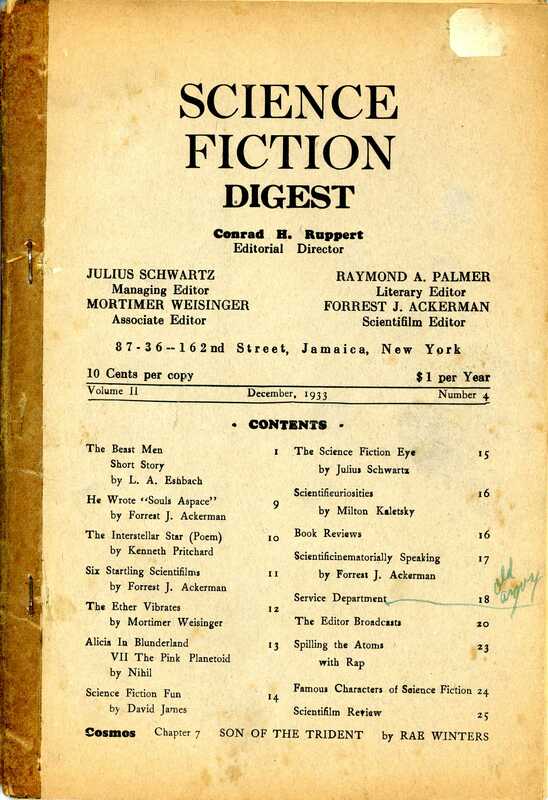 The December, 1933 issue of SFD contained a couple of significant surprises. The first concerned the author roster for Cosmos, while the second was a major shift in direction for the entire magazine. With this writing comes the sad word that Miles J. Breuer is confined to a sanatarium, with a nervous breakdown from overwork. This means that the doctor, loved by all science fiction fans, will not be able to write his part for COSMOS. This is certainly a great loss to the super-serial COSMOS, and to us, who love his writings, and we will have no time to replace him with a writer equaling him in reputation, but we have secured the services of Miss Rae Winters, who wrote “The Girl from Venus” and its sequel, which you will read in this magazine in the near future. Miss Rae Winters shows extreme promise and I am sure she will develop into a fine writer. Thus, chapter 7 of COSMOS, in this issue, is written by Miss Winters. It will be interesting to note that Miss Winters, when called upon in an emergency, with only six days remaining until the time of scheduled publication, wrote her excellent part in four hours. This is only surpassed by Arthur J. Burks, who did his chapter in two hours. And I am sure that after you read the Neptune chapter, you will agree with me when I say that Miss Winters has an imagination second to none. She has done an excellent job in an emergency. COSMOS will gain much from her contribution. And if you do not thrill to the love story of Steepa and Teena, then Miss Winters knows nothing of love. As for Miles J. Breuer, his loss is irreplaceable. But one consolation we have. The lovable doctor has promised to do something for us when he recovers. We will be waiting for that something anxiously. It will certainly be one of the best stories ever published in SFD. We wish the doctor a quick and complete recovery, and in recognition of our appreciation of his genius, we present him with a subscription to FANTASY Magazine so that he may continue to read COSMOS to its thrilling conclusion. I know that he will be interested in Miss Winters’ part because it represents the position he was to occupy. …Demands for a sequel to COSMOS are already coming in. Well, readers, if my hair is not entirely white by the time COSMOS is finished, I will take that to be an indication that I will be able to survive another super-novel. But it looks tough. No wonder those collaboration novels are rare. I never took a tougher job. But what a story! Isn’t it worth it? Thank goodness for the timely intervention of the talented Miss Rae Winters! But as it turns out, Ray’s effusive praise was actually for someone he knew very well: himself. These early writers often published under a variety of pen-names. Faced with a crisis, Palmer wrote the chapter himself and used his column to build up the reputation of his female alter-ego. His skill as a self-promoter became even more evident as his career progressed. Since our inception a great many fans have urged us to extend our scope to include the weird tale, as well as science fiction. Recently the requests have become so overwhelming that we have finally decided to make a very drastic change in our policy. Beginning with the next issue, we will cover the entire field of fantastic literature. From the utterly weird story to the super-scientific story, we shall present the latest news and happenings in the field, as well as interesting articles on fantastic fiction by foremost authors. To conform with our new policy, which will be explained in more detail next month, we have also decided to change the title of the magazine. Was this a response to the September debut of The Fantasy Fan, a potential rival? A reaction to the increasingly popularity of Weird Tales during this period? Perhaps some of both. The collaboration between the FM and TFF continued over the next several months, indicating the staffs maintained at least a cordial relationship. The December issue also featured a fascinating letter exchange regarding a subject which is still controversial: what would a passenger see out the window of a spaceship traveling near, at or above the speed of light? Perhaps more so than today, sci-fi readers of this era tended to take the “hard science” aspects of the stories very seriously, while at the same time suspending disbelief in things like travel through the fourth or fifth dimension. “COSMOS thus far has been superb but its excellence has been marred in Chapter One by a most hideous mangling of scientific fact. “The velocity of light cannot be exceeded by a material body. For the purposes of this story, however, let us grant that that statement is incorrect. If then, the speed of light may be exceeded, it follows that the Fitzgerald contraction does not occur, for if it did Dos-Tev’s space ship could not have traveled at two and one-half times the speed of light. “If the Fitzgerald contraction were non-existent, then the other phenomena, such as the reversal of space, would not have been present. But the reversal of space did occur, which means that the Fitzgerald contraction occurred also. If that were the case, the velocity of the space ship couldn’t have exceeded c in the first place, altho we assumed that it did. “Then, too, Alpha Centauri is a triple star, not a binary as Farley states. “In view of the fact that it has not yet been scientifically established that there is any such thing as absolute motion, we must regard all motion as merely relative. “Mr. Kaletsky will probably concede that, if three objects (A, B, and C) are initially located adjacent to each other, it would be physically possible for A to move away from B in one direction with a velocity of 150,000 mi-sec, and for C to move away from B in exactly the opposite direction with a velocity of 150,000 mi-sec, this velocity being well below that of light. Result: the relative velocity of A with respect to C, or vice-versa, is 300,000 mi-sec, which is well over the velocity of light. “Mr. Kaletsky will probably concede that a sustained acceleration equal to g, is physically possible. Such acceleration will eventually cumulate to a velocity greater than c. What then? Does this accelerating object suddenly go pouf? And does it come into existence again, as soon as it begins to slow down? The Fitzgerald theorem does not require any such conclusion. “The Fitzgerald theorem, when carefully analyzed, is seen to postulate not an actual absolute contraction of a body moving in absolute space, but rather an apparent relative contraction of a body moving with respect to something else; i.e. with respect to either an outside observer or the either stream. Obviously, inasmuch as the relative motion of a man and the body on which he is located is zero, he will observe no change in the shape of that body. The Fitzgerald theorem was based upon the failure of Michelson and Morley to be able to observe any change in the length of their apparatus, as the ether-stream swept along it; for, if they could have observed any change, they could thereby have measured the ether-drift. “This is exactly how I used the Fitzgerald contraction in my chapter of COSMOS. Dos-Tev saw space contract to zero about him, but noticed no change in his own ship. “As to Alpha Centauri being a triple star, neither the Brittanica not any star-list that I have been able to find, lists that star as other than binary. If it is ternary, this must be a very recent discovery. Perhaps one of its planets, shining by reflected light, is the third star. Or is Mr Kaletsky thinking of the recently discovered new star elsewhere in the constellation Centaur? “I will admit that there is one real scientific flaw in my chapter, a deliberate sacrifice of scientific theory to literary license; for there was one phase of the mathematics of relativity which I was unable to interpret physically. But no one has yet spotted it. As usual, the fans have strained at gnats (non-existent gnats, at that) and have swallowed veritable camels. Relativity was relatively new, having been published in 1916. Few in 1933 understood it, even among those who claimed to. Mr Farlay clearly did not. As for the debate over Alpha Centauri, I expect Mr. Kaletsky was referring to Proxima Centauri, discovered in 1915. It is viewed as being in the gravitational influence of the binary stars of Alpha Centauri, but the three are not seen as constituting a triple system. “Professor Arnaud” may refer to Joseph J. Arnaud, who worked as an Assistant Astronomer at the U.S. Naval Observatory during the 1920’s. Ray Palmer refers to him as a “fact-checker” for Chapter One of COSMOS in his notes in the July, 1933 issue of SFD. …Dr. E.E. Smith’s “Triplanetary” will positively start in the January issue of Amazing Stories. Triplanetary was one of the first sci-fi tales that I ever read (in its later novel form), and is at least partly responsible for starting my own fandom. Read Chapter Seven of Cosmos. Read about the January, 1934 issue.